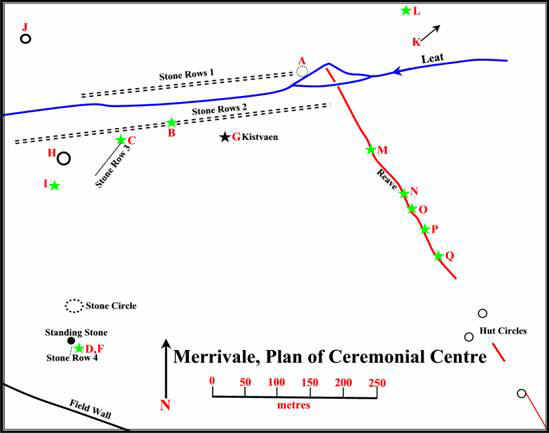 The Merrivale ceremonial complex is probably one of the second most important ritual landscapes on Dartmoor. The inquiring mind will find many references to it in many books. But they are all brief mentions, which leaves the reader thirsting for more knowledge. This is an attempt to bring all those snippets together and to provide a larger picture that encompasses not only single features but the whole ritual landscape as a complete entity. As with any investigation into a landscape it is helpful to start by looking at a map. This will present a picture of the surrounding landscape and its features. 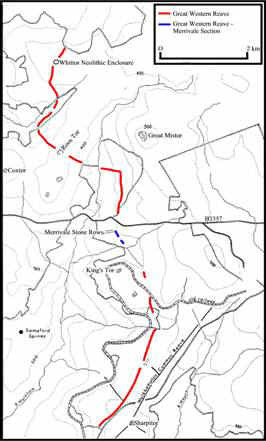 The Ordnance Survey map for the Merrivale area is shown below. As can be seen from the map, the area shows features from various historical periods. Clearly there are the pre-historic remains; there are later features such as the warren, the blowing house and tin workings associated with mining activities. There are modern features such as the pump house and quarry. All these features have been built up layer upon existing layer through the ages. These various combined layers of activity are known as a ‘palimpsest’. This has made the landscape into a sort of layer cake and to discover the prehistoric layer we must metaphorically strip away all the previous features, leaving us with the early landscape with its features and uses. This examination will only be concerned with that early prehistoric layer and feature on the ritual remains of the complex, namely the stone rows, circles, cairns, menhir and kistvaen. 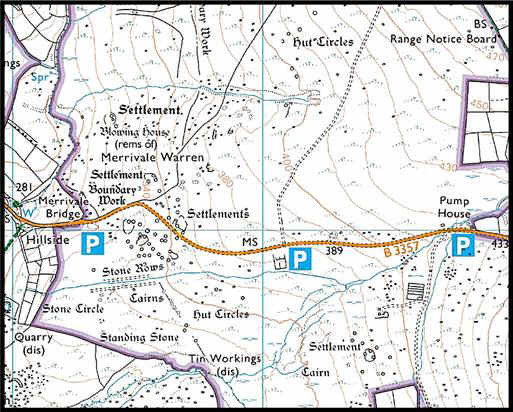 Having looked at the map, it is then useful to see if there are any clues in the actual place name. The first recorded mention of Merrivale was in the assize roll of 1307 when it was recorded as Miryfield. Glover, Mawer and Stenton (1992 p.247) suggest that the meaning of Merrivale is ‘Pleasant open space’ derived from myrig (pleasant) and feld (open space). Over the centuries this has now mutated to Merrivale. There is nothing to be gleaned from this place name, except a question, why was this open space ‘pleasant’? Was it pleasant in a scenic way or was it pleasant in a spiritual way? If the latter, then could this indicate that this area of land had an ancient ‘spiritual’ meaning of some sort? It is worth remembering that there was a vogue during the early 1800s for attributing nearly every archaeological feature or strange rock formation to the Druids and their ritual practices or to other strange biblical races. In this case, Arkite is defined as: “a designation of certain descendants from the Phoenicians or Sidonians, the inhabitants of Arka, 12 miles north of Tripoli, opposite the northern extremity of Lebanon. There are various theories that the Phoenicians visited Dartmoor in search of tin. Clearly back in the late 1800s archaeology was in its infancy and had many fanciful theories and practices. Around the same time various travelling writers were wandering the wastes of Dartmoor postulating about what they discovered. He also includes in his book an illustration of the “stone avenues”, sadly the drawing is not attributed to any artist but as can be seen from the picture below there was a certain amount of ‘artistic license’ used. Page also describes some of the farming practices at the time as being responsible for some damage. He remarks: “Turf-cutting in the immediate vicinity of the longer avenue is probably responsible for the demolition of the circle, while the tempting shape of the slabs in the cairn proved too much for the archaeological tendencies (if he had any) of the moor farmer”. Finally he ends his ‘virtual tour’ of the complex by putting forward some theories of the time regarding the original purpose of the features. One possibility was that they are “relics of ancient British serpent worship”. Another idea was that “the avenues were erected in memory of some great battle and represent the lines of opposing forces, or perhaps the ranks defending the village in the rear”. He then suggests that perhaps the space between the avenues was “a racecourse for British charioteers, or a processional path of the Druids” with the cromlech being used as a “place of sacrifice”. One could nearly suggest that as Mrs Bray’s book was published sixty-nine years before Pages’, a certain amount of plagiarism took place. Today we can sneer at these early ideas and theories. Heaven help us, we all know that the Druids were a feature of the Iron Age and the earliest chariot so far discovered is at Wetwang and dates to 400BC. Both postdating the Merrivale features by at least a thousand years and oh aren’t we so clever. What about some of the modern theories? “They are landing strips for alien space crafts” or they are “centres for earth energies.” Surely, we have no excuse for such thoughts over a hundred years on. Either way, it is useful to examine the early writings of Merrivale and compare them with the modern thinking. 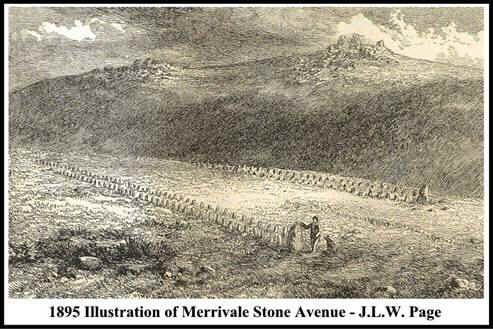 Crossing’s final thoughts on Merrivale are that the stones in the rows and circles are small, and the final effect cannot be said to be striking, which could be taken to mean he was not at all impressed, which could be anybody’s initial thoughts until the whole complex is taken into consideration. There are several interesting remarks in the above description. Twice it is noted that some of the features of the Merrivale monuments are unique to Dartmoor. These being the central cairn of the southern stone row and the actual avenues formed by the stone rows. Does this suggest that Merrivale is ‘special’ in some way? 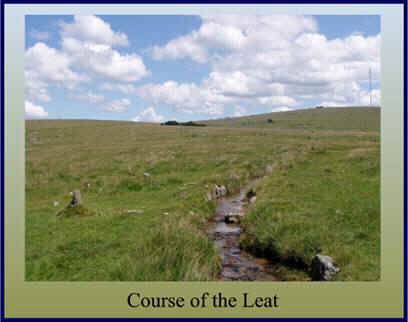 He also remarks how the leaking leat has made the site a “morass”, luckily the leat has been repaired and today there is very little evidence of morasses caused by an unmaintained leat. Another noted author to remark on the Merrivale complex was Eric Hemery. 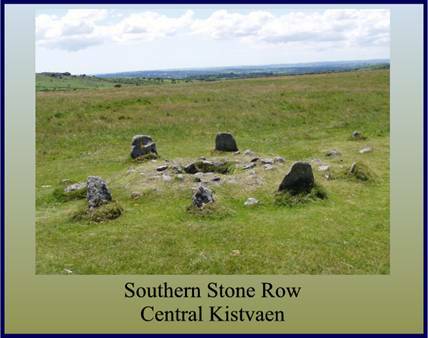 In his book ‘High Dartmoor’ (1983 pp.1046-9) he describes the site as: “consisting of kistvaens, a stone circle, menhirs, cairns, three stone rows, each with a blocking stone – two double and one single, as well as traces of at least one other single stone row. 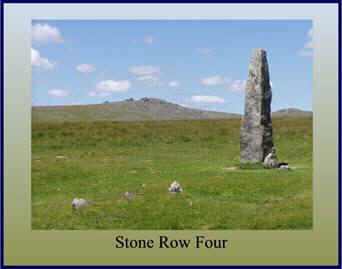 Hemery records the northern stone row as being 180 yards long and the southern row 280 yards long.” And apart from a brief description of the cairns, kistvaen and stone circle, is all he has to say. Visit the Merrivale complex today and what do we see? Basically about the same as Page saw in 1895. Probably the most accurate and detailed description of the site is that given by Jeremy Butler (1994 pp. 24-31). He recommends that the best approach to the monuments is downhill from the east; this is the only direction that delivers a view over the whole complex. A plan of the features is shown below in figure 3. The first features to draw the eye are the two double stone rows. These are aligned along the crest of the ridge shown as stone rows 1 and 2 on the plan. They are not quite parallel with each other and consist of neatly paired stones. Neither row is exactly straight. Between these stones the pit of the cairn marked ‘F’ on the plan can be seen. On the south-facing slope the stone circle occupies a less prominent position than the double stone rows along the ridge. It consists of 11 stones averaging 0.4m in height. Their arrangement is eccentric to say the least, with most of the stones being up to a metre off a true circle 19m across and with very variable intervals between. The strange thing with the circle is that several detailed accounts of the nineteenth century show that the number of stones has varied from 9 in the early part of the century, 8 in 1828, 10 in 1829, 9 in 1859 and finally 11 in 1895. This means at least 2 stones have been added, probably by some of the early antiquarian investigators who were not always accurate in recording their restorations. The stone circle can be seen in figure10 below. Almost in line but north of the double stone rows is a circle of slabs. This is recorded as a ‘hut circle’ on the Ordnance Survey maps. 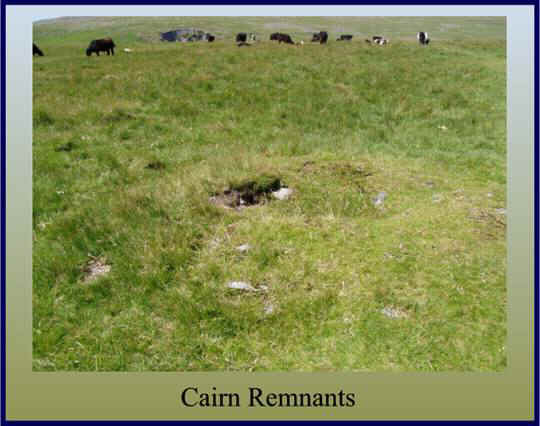 However it is possible that as there is a single ring surrounding a flat interior, this could be the site of another cairn. This feature is marked ‘J’ on the plan. There is early evidence of a large cairn once situated on the north side of the present road and is marked ‘K’ on the plan. It was shown on a map drawn up by the Exploration Committee’s report of 1895 and appears to have been roughly the same size as the large cairn once covering the Kistvaen (‘G’ on the plan). The other main cairns (marked M, N, O, P and Q on the plan) are all sited alongside or across the reave which runs northwards from the Long Ash enclosures. Because some of the cairns are built across the reave and have left gaps in it where the stones were taken for the building materials, it can be assumed that the reave pre-dates the cairns. Two more cairns are located above the leat and are marked ‘L’ and ‘K’ on the plan. Having mentioned about how modern man has desecrated various features at Merrivale it is interesting to note how considerate the leat builders were. As can be seen in figure 14 below, they built the leat straight between the two sets of stone rows. Although the leat caused later damage due to the lack of repair its original construction appears to have had little structural effect on the site. There has been previous mention as to how modern man has been exploiting the site with regards to stone removal. A visit to Merrivale will soon reveal the extent of how the stonecutters worked the area. 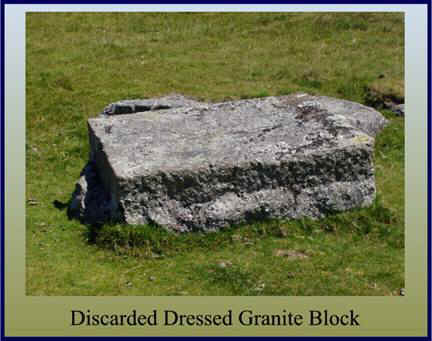 Figure 16 below shows just one of many examples of blocks of granite that have been worked in-situ and for some reason or other discarded. If the number of remaining slabs of worked granite are regarded as waste, what else has been deemed complete and removed? One would have thought that given the age of the Merrivale stones and the superstitions of the old moor folk that myths and legends would abound. Sadly this is not the case. Crossing (1990 p. 94fn) notes how the stone rows were formerly known locally as the ‘Potato Market’ and ‘The Plague Market’ and that a tradition stated that food and provisions were brought to the stone rows by the country people and left as supplies for the Tavistock towns folk at a time when the plague struck the town. In view of the existence of the splendid Kistvaen, again there is no legend attached to it. 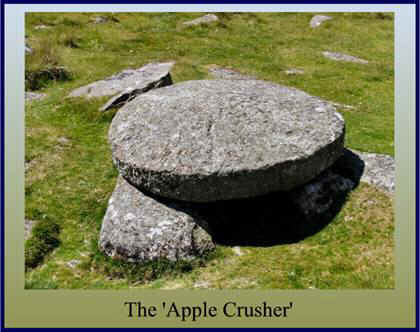 Many of the other kistvaens on Dartmoor have stories of hoards of treasure and curses such as ‘The Money Box’ and ‘The Crock of Gold’, but ‘nought’ for Merrivale. Having looked at the archaeological remains of the complex, what can we surmise was its purpose? It will be interesting to look at several viewpoints, firstly the modern archaeological theory, then the more fanciful yet none the less plausible archaeological idea and finally delve into the realms of myth and magic. Depending on where ones sympathies lie all are possibly valid explanations. If anyone can positively prove to what purpose this complex was used then they could become very rich and very famous. From a modern archaeological aspect the purpose of the Merrivale complex can easily be described as ‘ritual’. Gerrard explains this concept most succinctly in his book, ‘Dartmoor (1997 pp.54-64). Firstly it will be as well to put a date to the various monuments to be found at Merrivale; here we are talking the Bronze Age (c.2300-700 BC). So what was happening at this time? The place to get that answer is the landscape. From looking at today’s landscape we can see that during the Bronze Age there were cultural and social changes occurring. Whilst the stone rows and circles from the Neolithic period were still being used, cairns continued to be used for housing the dead, but now instead of containing multiple burials they contained individuals. We also see the appearance of stone-built settlements and their associated fields. By the Middle Bronze Age (c.1400-100 BC) there is evidence of several large and well-defined ‘territories’ marked out by a series of boundary banks called reaves (more of which later). The Merrivale complex demonstrates every example of Bronze Age monument, namely burial cairns, a menhir, a stone circle and stone rows. These ceremonial monuments were built by people living in the nearby settlement and must have played an important part in their lives. The location of ritual monuments may also reveal how the landscape was organised to meet what spiritual requirements the early moor dwellers had. It has been suggested that ‘prestige cairns’ (cairns with a diameter of more than 20 metres) lie in impressive locations that would enable them to be seen from great distances. One reason for this could be that they were meant to impress and inform neighbouring groups or newcomers that the area was already occupied – a ‘trespassers will be prosecuted’ sign. They may also have been seen as a symbol of social identity and ‘oneness’ to the communities that built them. Smaller cairns possibly were used to delimit territories at a local level. It has also been suggested that the occurrence of clusters of cairns around stone rows may also have been used to delineate territories and also that clusters indicate a settled population which used the same site for several generations. 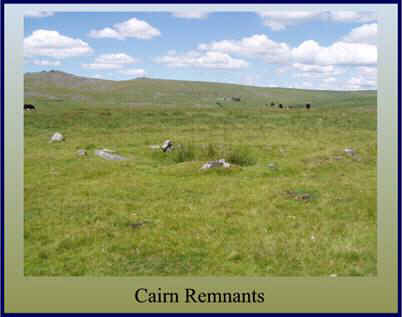 It is generally accepted that the presence of five or more cairns places the site into a category defined as a ‘cairn cemetery’. Where does this place Merrivale? It has been established that the cairn cluster around the reave consists of five cairns, therefore this can be regarded as a ‘cairn cemetery’. The cairns are also associated with the stone rows so maybe they were used to mark out a local territory and also their numbers suggest a settled population. There is possible evidence of 2 cairns that had a diameter of over 20 metres thus giving us at least two ‘prestige cairns’. Were these used as symbols of power and status for the inhabitants of the territory that they marked? It is interesting to note that the cairn cluster post-dated the reave. As noted above, reaves were originally used to delineate territories, so did cairn building imply that the political statement made by the reaves was no longer strong enough? Therefore, necessitating the need for stronger markers. 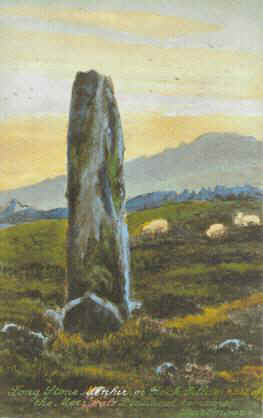 Considering the size of Dartmoor and the number of pre-historic features existing within its boundaries there are very few examples of standing stones or menhirs. They are typically very difficult to date, however some examples in the south west are known to be associated with Bronze Age material. The general consensus is that the Merrivale menhir is Bronze Age in date. The menhir is one of the most puzzling archaeological features as there are several ideas as to its original purpose. Was it a way marker, a territorial marker, a grave, a cemetery marker, a focus for ritual activity or did it denote a meeting place? 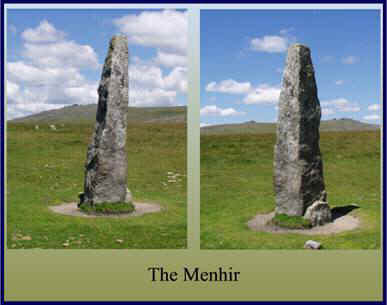 The Merrivale menhir could easily be one or a combination of the above suggestions. Personally I would disregard the territory marker theory as there is evidence of a reave which clearly denotes a territory along with the many cairns. Is it plausible that the stone marked a track way? Possibly, but its location would have been better served higher up the slope if this was the case. Could it be a grave? Maybe, but if all the features date to roughly the same period why would they use a menhir to mark a grave when they are already building cairns (and big ones at that) to serve the same purpose. Considering how near the stone is to the cairn cemetery it could have been used to mark this. It may also have been used as a meeting place or a focus for ritual activity. We then come on to the stone circle and another set of questions. What is a stone circle? 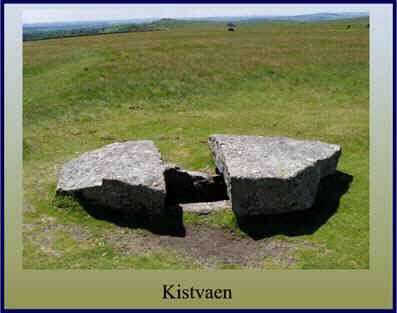 In the context of Dartmoor, it consists of a ring or rings of upright stones, which are enclosing an open space. 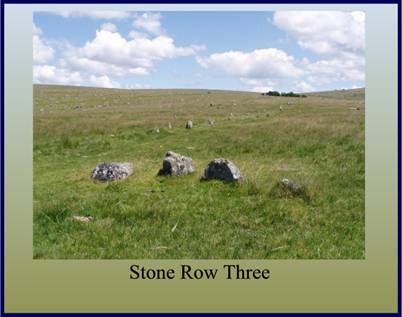 There are at least 18 examples of stone circles on Dartmoor, and it is known that several others have been destroyed. In the order of things the Merrivale circle is rather insignificant as eight of the other circles are over 20 metres in diameter with the largest being 39 metres. 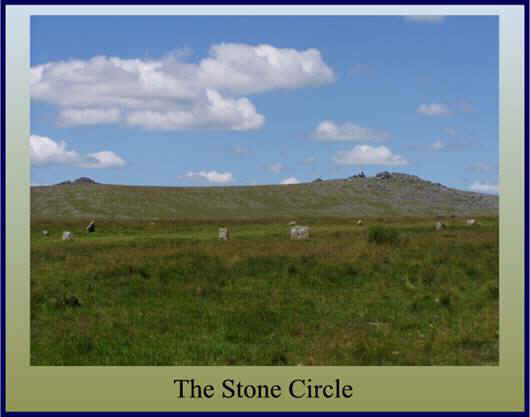 It is possible that the Merrivale circle is one of two known Dartmoor circles to have originally had a second ring constructed immediately outside the first. This type of circle is called a concentric circle. Of the stone circles that have been investigated, at every one a layer of charcoal was found covering the old ground surface, which may imply that fire played an important part of whatever ritual practice was being conducted at such sites. 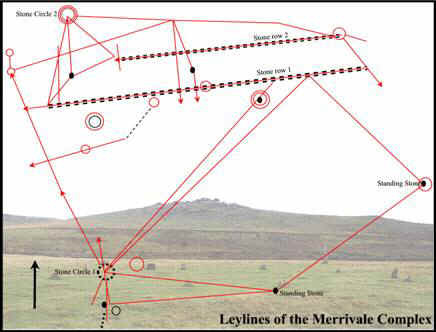 Sadly Merrivale was not one of the circles investigated so we can only assume that it conforms to the above findings. There has been a great debate as to whether stone circles were used as some sort of astronomical observatories and were used as calendars thus allowing their builders to calculate the changing seasons. This theory will be examined shortly but in this context, one word of caution. 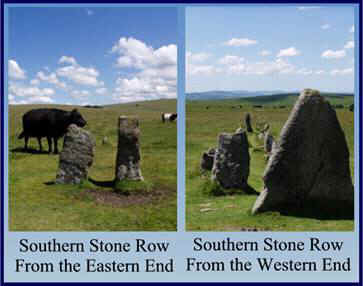 Many of Dartmoor’s stone circles have been the subject of examination during the 19th century when there were partially or wholly re-erected. In some cases the restoration may not have conformed to the original layout of the stone circle and may even have seen the inclusion of ‘extra’ stones to fill in any gaps, thus making any conclusions regarding astronomic alignments somewhat tenuous, a point confirmed by White, (2000 p.26). As can be deduced from the above, the various prehistoric features at Merrivale raise more questions than we have answers for. Partly due to the lack of modern investigation and partly due to the damage caused by man over the following centuries. What is clear is that the surviving monuments are evidence as to the importance of spiritual and ritual practices to their builders. It also indicates that in order to build such features there surely was a great deal of social organisation needed. The logistics required to plan, design and build structures that in some cases involved the movement of heavy slabs of granite, would test even today’s engineers. In order to organise a workforce capable of such tasks there would have had to be a person or persons with the ability to command and control. This alone, points to a structured society that contained a ruling elite, either secular or religious. From the autumn equinox the setting sun moves gradually south along the western horizon. 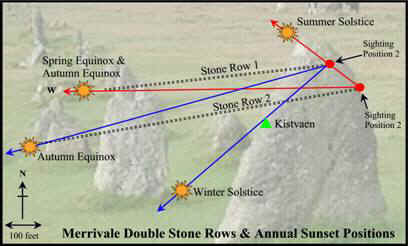 If the blocking stone of the northern stone row is now used as the sighting position (sighting position 2 on plan) then at the autumn equinox the sun sets at the end of the southern stone row. The sunset on this alignment progressively moves eastwards until the winter solstice (21st December). So by using the same methods as above it should be possibly by using sighting position 2 to calculate the days from the 22nd of September to the 21st of December. Then as the sunset returns back along the alignment it would be possible to mark the days from the 21st of December until the spring equinox on the 20th of March. After that the sighting position is moved back to position one and the annual cycle repeats itself. These alignments are shown in blue on the above plan. The theory sounds plausible until the alignment for the winter solstice is examined. There is no existing feature for plotting this alignment. As shown on the plan all the other alignments end neatly with blocking stones apart from this one. Walker contends that as there is evidence that a cairn was built over the kist, A fact he cites from Butler (1994 p.30), this would have provided an artificial horizon to align with sighting position 2 at the winter solstice, therefore completing the calendar. The kist in question is the one marked ‘G’ in figure 3. Butler does not give any indication of the height of the cairn, only that it was 2.2 metres long. He states it was the largest cairn on Dartmoor but is this sufficient proof to provide a missing alignment? 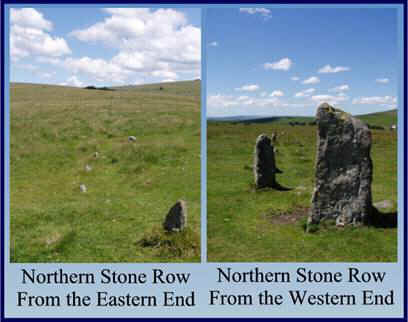 Walker concludes his theory by stating that due to the preservation of the Merrivale stone rows and the fact that the sun’s position relative to the earth has only changed by about 1º over the last 4,000 years, the accuracy of the alignments is virtually as it was in the year 2000BC. Which is fine, but I wonder why the people of this time would need to know in such detail what time of year it was. I would have thought that from an agricultural aspect there were enough natural indicators as to the time of year without having to go to the trouble of building a specific ‘stone calendar’. Another noted supporter of this theory is Brian Byng. 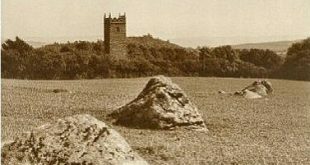 In his book ‘Dartmoor’s Mysterious Megaliths’ (pp.24-7) he suggests that there is an alignment from the stone circle to a notch on Middle Staple tor on the midsummer sunset. He also promotes the idea that a slab located 280 yds north of the road points to Pew tor and that there is a fallen menhir near to it. This gives an alignment to a ‘v’ shaped notch on the tor for the winter solstice. On his plan of the site he has managed to find three menhirs within the complex. As mentioned above one of these menhirs is above the present-day road and is amongst the northern hut circles of the settlement. If this is the case then this would extent the ritual complex considerably. No other authors make mention of this menhir. D.N.P.A. 2003 A Guide to the Archaeology of Dartmoor, Halsgrove, Tiverton. Sullivan, D. 1999 Ley Lines – A Comprehensive Guide to Alignments, Judy Piatkus Publishers, London. Hi Tim – thanks for maintaining this excellently useful and often entertaining site. A question – in the first line of this entry, you refer to Merrivale as ‘the second most important ritual landscapes on Dartmoor’ – which are you thinking of as the first? I’m sure I’ll kick myself when you answer, but my mind’s totally blank. In my opinion the Bellever/Lakehead Complex.